With the price of gold staying firmly above $1,300/oz, Brien Lundin, editor of Gold Newsletter, discusses the state of the market and several top picks in an unlikely location. Brien Lundin, the well-respected editor of Gold Newsletter, is an industry veteran with over 30 years of experience. He began his career working with the visionary Jim Blanchard, one of the original gold bugs in America, who founded Gold Newsletter in 1971 to advocate and lobby for the return of the right of legal gold ownership for Americans. After the law was successfully overturned in 1974, Blanchard started a conference to educate Americans on how to invest in gold. The conference evolved into the annual New Orleans Investment Conference, featuring giants of economic and geopolitical thought, and Gold Newsletter became one of the world's most respected precious metals advisories. Following Blanchard's death in 1999, Lundin has worked to continue his legacy with Gold Newsletter and the New Orleans Investment Conference, seeking to show investors through bull and bear markets how to maximize and multiply their investments in precious metals. Gold Newsletter was among the first, if not the first, newsletter to recommend companies like Silver Standard, Northern Dynasty, NOVAGOLD and Silvercorp that have multiplied investors' money 20, 30, even 40 times over. Gold Newsletter remains one of the top performing newsletters. A recent recommendation is up over 100% in just a few weeks. Streetwise Reports sat down with Lundin to discuss his views of the market and several top picks. The Gold Report: Brien, what's your outlook for gold over the next year or two? Brien Lundin: One of the noteworthy characteristics of the gold market over the last couple of years has been a very tight inverse relationship to the U.S. dollar, in particular the U.S. Dollar Index. If you want to figure out where gold's going, you need to look at the U.S. dollar and what's driving it. Our analysis shows that the dollar is most likely headed lower over the next few months and even over the next couple of years. And what will be driving that is the fact that the Federal Reserve is well along its rate hike campaign and could end that campaign as soon as the end of this year, if it's able to get four rate hikes in and get up to about 2.5% on the Fed Funds rate. At the same time that the Fed is nearing the end of its rate hike campaign, the European Central Bank, the Bank of Japan and the Bank of England will just be beginning their own processes of quantitative tightening. "If gold rises to near $1,400, then Lion One has the potential to double in value." What's happening now is that big money investors are switching their bets from the dollar to the euro, the pound, the yen, and, in effect, selling the dollar and buying these other currencies. As a corollary to that investment, they're also buying gold; when the dollar goes down, gold typically goes up. So that's how we're getting money being diverted and reallocated into the gold market. And that's a trend that should go on for the next couple of years. TGR: You've been the editor of Gold Newsletter for many years now, and the organizer of the annual New Orleans Investment Conference. In Gold Newsletter, what criteria do you use to select companies? BL: We have an active portfolio that numbers about 30 companies right now. We divide those into Buys and Holds, Buys being companies that we recommend for immediate purchase. Holds basically serves as a designation that investors can hold or sell according to the individual needs. What we look for in a Buy recommendation is a junior mining company that has the potential to roughly double or more in value over the next year. These are the kinds of returns that are available in junior resource stocks that aren't available in more mainstream investments. Now, of course, they come with a greater risk to counterbalance that much greater potential reward. But we try to eliminate as much of that risk by possible by ferreting through literally thousands of companies in the sector to find the ones that have talented management teams, outstanding properties, good share structure, adequate financing and some near-term catalysts that would serve to open up or daylight value in the company, whether that be a drill hole or a takeover by a large company or some other mergers and acquisitions-type activity. TGR: Would you tell us about some companies that you are excited about? BL: One area that's particularly interesting to me is Fiji. It's not known for its geological potential, but in fact for over 100 years it's been known as a premier mining destination with some large-scale discoveries. At the present time, though, there are only two junior companies that are really well-positioned for investors to take advantage of this relatively new frontier in modern day mining exploration. "Lion One boasts tremendous exploration potential." The one that was first really in Fiji and is most advanced, is Lion One Metals Limited (LIO:TSX.V). 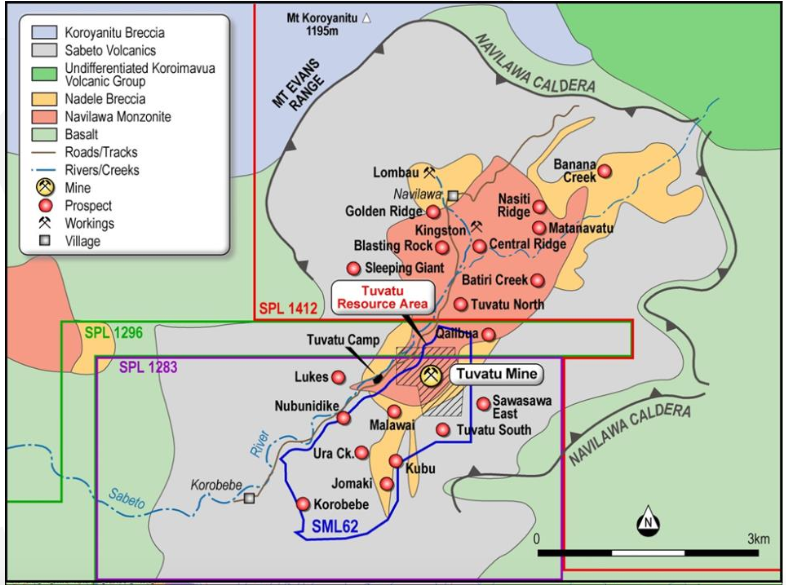 It has the Tuvatu deposit, which is a high-grade, underground deposit that currently has about 750,000 ounces (750 Koz) in all resource categories. The key with Lion One is that it is rapidly advancing toward production, actually building that mine on its own. It is not in a joint venture with anyone. It is advancing toward production because it has a very adequate resource base to begin production. That said, it also boasts tremendous exploration potential. It has not found the boundaries of the mineralization in that deposit. It's open in all directions and at depth. In addition, it has considerable land holdings in outlying targets it has yet to explore. So there's tremendous upside potential for Lion One. TGR: Would you tell us more about its deposit? BL: It's a high-grade, epithermal gold deposit. It is underground. And interestingly, the company is actually discovering new zones even as it's developing the mine. Even in some of the process to developing the mine and move earth here and there, it is uncovering new, shallow, high-grade gold zones, the limits of which have yet to be delineated. The mineralization is fairly close to surface, especially some of the recent mineralization that it has discovered. The project projects very good grades, an average life-of-mine feed grade, in fact, of over 11 grams per ton gold. So, it's not going to be a very expensive project in terms of cash costs per ounce. With nearly 750 Koz of resources at this point, it should be able to produce more than 100 Koz per year, and its goal is to do that for over a 10-year mine life as it discovers additional resources. Lion One is headed by a gentleman named Wally Berukoff, who is well-known in the mining industry for a number of previous large-scale successes. He was a driving force in the growth of Miramar Mining Corp., La Mancha Resources and Northern Orion Resources. TGR: How is Fiji on permitting and mining friendliness? What's Lion One's situation with its permitting? BL: Lion One is completely permitted and ready to go. Fiji is actually set up to be very welcoming to exploration and mining development. It has an established mining code and rule of law. Permitting is a very straightforward process. As is the case in many underdeveloped countries in the world, sometimes it can be frustratingly slow, but it's done in a very straightforward and fair-handed manner. I don't believe that Lion One has ever had any issues with getting a permit. TGR: How soon do you think that Lion One will be able to complete the mine and start mining? BL: I don't think Lion One itself knows because it has yet to make an announcement of an anticipated completion date. It does expect to have most of the earthen work and ground preparation completed by Q2/18. After that, it will have some degree of mine construction remaining. I would expect it to be in production next year sometime, if not before. "The key with Lion One is that it is rapidly advancing toward production." One of the key things about a company like Lion One is that it has large proven resources and in my experience, these are the companies that benefit most directly from an increase in metals prices. Companies with large resources are the first to move, and they can move very quickly once the general investing public recognizes that metals' prices are on the upswing. I don't think we've had that broad-scale recognition in this market yet. Thus, Lion One is still trading at a fraction of its peak values. I think it has a lot of room to run and could do so in very short order. If we have another month or two of rallying gold prices behind us, if we can get into the high $1,300s to near $1,400 on gold, then I think you're going to see a company like Lion One with the potential to double in value on the back of that kind of a rise in the metals. The good thing about Lion One is even if gold prices hold steady, it is advancing toward production, so it's going up the value curve just by virtue of the fact that it is advancing its project and developing it. So I think it's going to get to easily double its current share price, either through an increase in the metals prices in the near term or as it develops the mine over the next 12 to 18 months. TGR: Let's talk about the second company in Fiji. BL: I'm actually a co-founder and a chairman of another company that's operating in Fiji called Thunderstruck Resources Ltd. (AWE:TSX.V; THURF:OTC.MKTS). Thunderstruck is at a much earlier stage than Lion One. It's much more speculative than that larger company. Thunderstruck's land position holds two confirmed discoveries by Anglo American Plc (AAUK:NASDAQ) in the 1970s of high-grade, volcanogenic massive sulphide (VMS) copper-zinc mineralization. Not very many companies at this stage or valuation can boast of having two discoveries of this sort. The company now has to follow up on these discoveries. Each of them had about 15 holes drilled into it, nearly enough to develop a resource but not quite there. So Thunderstruck needs to go back in and, either by itself or with a joint venture partner, expand on these previous discoveries and start building a resource. In addition to these two high-grade zinc-copper discoveries, the company has an identified copper-gold porphyry target that was discovered through drilling by Anglo and a potential high-grade, epithermal gold target uncovered through sampling. It's a lot to chew on for a small company right now, but Thunderstruck has only recently been able to obtain all of its necessary land use approvals and permits and is now actively going back in, following up on these discoveries that have lain fallow for over 40 years. And it's exciting times at this point for this very early-stage company. TGR: What's next for Thunderstruck? BL: The company has just done its first detailed surface work, following up on Anglo's discoveries. It has uncovered some new gold and copper-gold anomalies that it will be following up on in the next exploration season. It's looking for a joint venture partner to take on the high-grade VMS discoveries, as these would take a good bit of drilling to build a resource. In the meantime, the company is going to compile an internal resource estimate to get an idea of how much high-grade zinc and copper were already roughly outlined by Anglo's efforts. We expect it to be a year of good exploration news flow for Thunderstruck. TGR: Thanks for your time, Brien.